If disregard for ethical conduct becomes a sign of spiritual fortitude there are serious problems that need to be addressed. One the three trainings is morality/precepts. Without morality, ethics or precepts (however you want to call it), there is no quality spiritual practice that can be cultivated. However, when you are the enlightened Zen master, even your blinking is a Dharma teaching, not to mention alcoholism, abusing students and using all the money for your comfort. From the paper: "In conclusion, I therefore concur with the aforementioned critics that the structure and teachings of Zen Buddhism itself lie at the root of the problem, and that the many cases of sexual or other teacher misconduct are merely symptoms thereof." Zen’s iconoclastic approach, based solely on the individual’s own meditation experience, was seen as a healthy counterpoint to the more theistic and moralistic world-views, whose leading proponents often privately flouted the very moral codes that they preached. 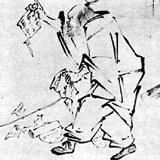 Huineng, Línjì and Bodhidharma flouted moral codes? When and where? The unspoken assumption in Zen has always been that the meditation alone naturally freed the accomplished practitioner from life's moral quandaries, without the need for rigid rules of conduct imposed from above. I've never heard of a zen tradition that does not have precepts to follow. The failure is due to faults of people, not faults of a tradition, teaching or practice. Blaming it on the tradition is just an easy scapegoat. Kinda like blaming Christianity for murder. It's nonsensical. People act unethically of their own accord. Some people clearly don't see any difference between amorality and immorality. If one is awakened, where is the need for rules? Antinomianism only works on the premise that the one who is not following the rule is capable of behaving appropriately to the circumstances at all times. One can blame the misdeeds of the past and present on a lack of insistence on following the rule. Alternatively, one can also blame these problems on a lack of awakening. In either case, clearly one has "more to learn." Nansen saw the monks of the eastern and western halls fighting over a cat. He seized the cat and told the monks: "If any of you say a good word, you can save the cat." No one answered. So Nansen boldly cut the cat in two pieces. Nansen said: "If you had been there, you could have saved the cat." What was the Buddha's stance on dismembering cats? Mumon's comment: Why did Joshu put his sandals on his head? If anyone answers this question, he will understand exactly how Nansen enforced the edict. If not, he should watch his own head. He would have enforced the edict oppositely. And Nansen begs for his life. The point is that realized practitioners shouldn't want or need anything from the world as it appears. Soto Zen Practice is based on keeping the 16 Great Precepts (The Three Refuges, The Three Pure Precepts, and the Ten Precepts), and Serene Reflection Meditation. Morality, in the form of the Precepts, could literally be described as 50 percent of Soto practice. To say then that "Zen has no morals" would be a grave misnomer. The idea that Zen practice means "you can do whatever you want without consequence", would be a complete perversion of Zen teaching. Karma, including cause and effect on a moral level is also a basic doctrine essential to Zen. Keep in mind, much of Westerners in general are unable to sepperate 'what is Zen' from what is simply 'Japanese Culture'. The Japanese, have a very interesting, and highly conformist culture, that is not the same as Zen Buddhist practice. I was recently reading a news article that was talking about a report on the summary of problems surrounding the recent earthquake and Fukushima Daiichi Nuclear incident, and one of the things the report came to, is that it blamed 'Japanese Culture' (Specifically the culture of conformism) as contributing significantly to the problems preventing it, durring the incident, and the response afterward. It's a problem I think the Japanese people are increasingly aware of, and are looking at. Part of bringing a tradition from one culture to another is sepperating out what are 'culturalisms' from what is actually Buddhist Practice. This is the same with any Buddhist Tradition. What is acceptable in Nepal and Tibet for instance, is not nessicarily what is acceptable here in the West. Ch'an is also Zen Buddhism, Just from China. Having a spiritual experience, does not mean that a person is a fully enlightened Buddha. It means they have made a first step toward deeper training. If they dont continue to do training, they can become just as off-centre as any other person. Also, having an initial spiritual experience, does not mean a person is free from greed, anger, and delusion. It just means they understand the consequences of thier actions better. Unfortunately, some people, even those who have been training for a long time can become off-centre. It is sad, but it does occationally happen. All we can do sometimes is offer those people merit, and try to clean up the mess. Sara H wrote: Unfortunately, some people, even those who have been training for a long time [and have received transmission and the title of Zen Master] can become off-centre. Does the fact that it can happen suggest that Zen has no morals? It means that people are human, and that people who are practicing Zen are human and make mistakes. It doesn't mean that they are immoral. Making a mistake and being immoral are vastly different things. Sara H wrote: Making a mistake and being immoral are vastly different things. Unless it is an immoral mistake, which is what we are talking about here. Sara H wrote: It means that people are human, and that people who are practicing Zen are human and make mistakes. It doesn't mean that they are immoral. Making a mistake and being immoral are vastly different things. The point of the paper is that Zen teachers are not seen as simply humans, but as enlightened super-beings. Also that's the reason they could keep their teacher position after decades of "mistakes". And that's why it is some fundamental (Western) ideas about Zen that is one source of the problem, namely the myth of Dharma transmission and the position it gives one. Well I can't speak for other traditions, but in my own tradition, and in my own experience, we certainly don't view Zen teachers as enlightened super-beings. I try to have compassion for someone. An "immoral mistake" as you put it still does not make someone an "immoral person". Everyone still has the Buddha Nature within them. In my experience, recognizing the Buddha Nature within someone else and focusing on compassion for them and all living beings, can be a very helpful way of dealing with any anger or resentment that arises. It's something I personally have found to be very helpful. I have never heard of ANY zen tradition teaching that zen masters are enlightened super beings. So why do some people view them as super beings when it's not an actual zen teaching? What is the source of that belief? It seems to me that the source is not any zen teaching but rather the ignorant mind of practitioners. So the ignorant mind of practitioners is really the problem. Kensho is transformative. One would think that satori is even more transformative. People can still make mistakes but not mistakes like sexually using/abusing students or systematically hiding issues from sangha members or methodically manipulating people. There are hallmarks of sociopathic people. There is an issue with Dharma transmission definitely. But there is also an issue with Zen awakening and enlightenment. I have said before that people who perpetrate this behavior have either no or very shallow awakening. kirtu wrote: There is an issue with Dharma transmission definitely. But there is also an issue with Zen awakening and enlightenment. I have said before that people who perpetrate this behavior have either no or very shallow awakening. Problem is, while in Japan in Sotoshu and Rinzaishu receiving Dharma-transmission does not allow people in and of itself to train monks, or necessarily mean that the person is enlightened. In the West, however, this was all messed up. So we see the results.